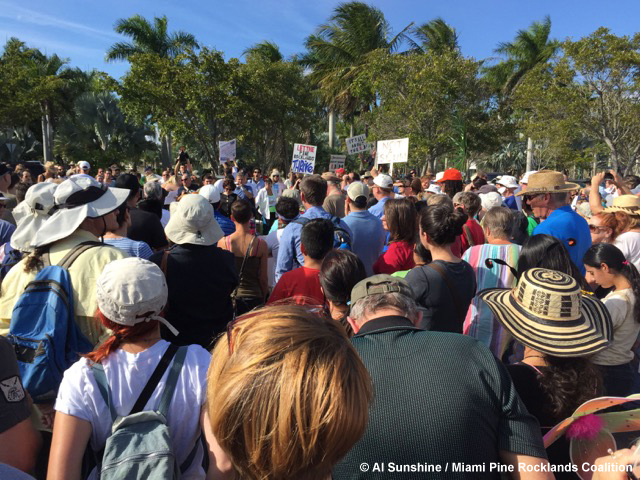 On January 17th hundreds of people marched along Coral Reef Drive, outside Zoo Miami, to support the preservation of the Richmond Heights pine rocklands, the habitat of numerous endemic species including the rare Miami tiger beetle. The Miami Herald reports the group of demonstrators stretched out “at least four blocks” in and around Zoo Miami, near the sites of proposed developments threatening the habitat. Large portions of these pine rocklands are the sites for Coral Reef Commons, a WalMart-anchored shopping center and apartment complex proposed by Ram Realty, and Miami Wilds, a major amusement park which has been pushed through by Commissioner Dennis Moss and backed by 20th Century Fox. These pine rocklands have survived comparatively unscathed since the since early logging and military developments on the site in the 1940s and these lands represent a quarter of the 1.8% of the habitat left outside the Everglades National Park. Any further development seriously jeopardizes the rocklands and their inhabitants, principally by further fragmenting the remaining rocklands and stifling brush fires, a necessary ecological cycle for survival of the habitat. Ram Realty Services is dedicated to the restoration of a significant portion of the land that we own. It should be noted that the Richmond Pine Rockland complex encompasses more than four square miles, of which 74 percent is under public ownership, with an additional 20 percent long ago developed by others. Purposely deceptive. The former Richmond Naval Air Station covered 2,107 acres (3.29 square miles). Today this area is the site of Zoo Miami, the Gold Coast Railroad Museum, the University of Miami south campus, a U.S. Coast Guard base, and several smaller developments. There is only about one square mile of pine rocklands remaining in the whole site. Environmentalists opposing the development of the site have continuously misunderstood the facts and the current condition of the property. I’ve spent significant time conducting research in the Richmond Heights pine rocklands and Ram’s claims are not an honest representation of the site. Presently 47% of the Coral Reef Common (CRC) site is pine rocklands and a further 19% is other, largely hardwood, forest. About 22% of the site is green space, minimally modified from their original state, and a final 12% is heavily modified or developed (buildings, major roads, and parking lots). This is not the heavily developed, hopeless situation the Ram paints. The Coral Reef Commons development site represents less than three percent of the Richmond Pine Rockland complex, and even less of the total pine rocklands in Miami-Dade County. Again purposely deceptive. Their figure of 3% is calculated from the total area of the site, not from the area of pine rocklands on the site. There are a total of 585 acres of rocklands on the former Richmond Naval air station out of which 65 acres (11%) sits on the CRC site. The notion that the Coral Reef Commons site is a pristine forest is erroneous. The Coral Reef Commons site is primarily (47%) pine rocklands. While not in pristine condition these rocklands have been minimally altered and represent a last chance to preserve this habitat. Out of the original pine rocklands only 1.8% is still standing outside of the Everglades National Park. On the left is an aerial photograph from 1952 and on the right is a 2014 satellite image (from Google Earth). Notice how little of the overall CRC site, outlined in red, has actually been significantly altered. Over the last 70 years the site has been used for military purposes, a medical research facility, commercial buildings, residential buildings, enclosures for animals, an incinerator and blimp bays. This site does have a unique past (see Paul Freeman’s great webpage and this history of the Naval Air Station) but these developments only comprise 12% of the CRC site (the blimp bays were located just to the south and east of Ram’s property, largely where the Gold Coast Railroad Museum now stands). Today the greatest threat to the area is continued development and the encroachment of invasive species. The present poor condition of these CRC site is due to the lack of any habitat management by the University of Miami, not excessive development. The school even denied requests from myself and other researchers to this and their other properties around Zoo Miami for access to the habitat. The best prospect for regaining the natural environment is a comprehensive restoration plan such as the one Ram Realty Services is developing with the U.S. Fish and Wildlife Service. Under this plan, almost 40 percent of our property will be restored to its natural native state, set aside and maintained as a natural preserve in perpetuity – a standard never previously achieved in the region. The Coral Reef Commons site is 137 acres but Ram’s planned preserves total just 43 acres (not all of it pine rockland) – just over 30% of the property. So, contrary to Ram’s claims, under a third of this property will be preserved. The solution is not to develop over two-thirds of the site and its pine rocklands. Under one-eighth of the CRC site has been developed. Perhaps there is a more appropriate use for this rare habitat than yet another Walmart. Let’s restore and preserve the seven-eighths of the property that is undeveloped and constructively use or mitigate the fraction of the property that is already developed. Pine rocklands are a unique and valuable part of Florida’s natural history and are worth preserving. Areas for which exact figures were not available were estimated with the polygon tool in Google Earth and the polygon area calculator on earthpoint.us. 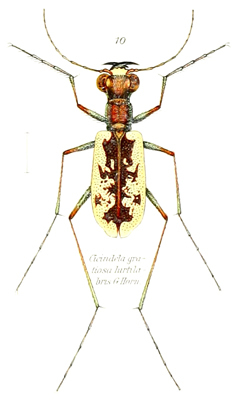 Carl Linnaeus (or his ennobled name Carl von Linné or the latinate Carolus Linnaeus) laid the foundations for binomial nomenclature, modern taxonomy, and recognized the tiger beetles as a distinct group. 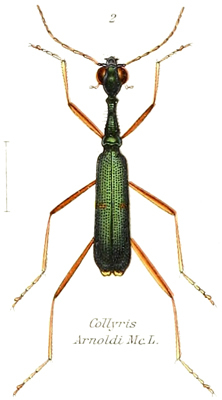 As with much of Linnaeus’ writing the description of the genus is in Latin; in the first edition of Systema Naturae he erected the genus Cicindela, noting that unique appearance of the clypeus and the prominent mandibles. 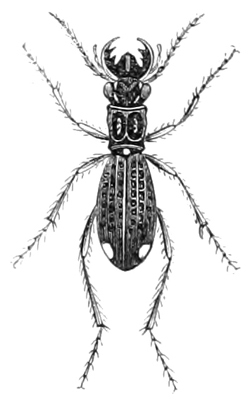 From the publication of Systema Naturae and through subsequent editions until his death Linnaeus described eight tiger beetle species. While the species came from Europe, North America, and South Africa Linnaeus placed all eight species in the genus Cicindela. Later workers have dispersed these species across five genera and ajoined numerous subspecies since Linnaeus’ death in 1778. Pearson, D. L., Cassola, F., 2005. A quantitative analysis of species descriptions of tiger beetles (Coeloptera: Cicindelidae), from 1758 to 2004, and notes about related developments in biodiversity studies. The Coleopterologists Bulletin, 59(2): 184-193.